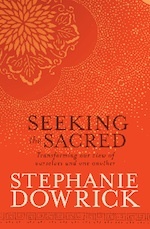 Imagine the world we would live in if we dared to see all of life as sacred. How do our beliefs shape the way we view our strengths and respond to one another? Are spiritual or religious teachings a cause of social unrest – or can they be a solution to it? Are we capable of resisting violence as a “solution” and learning to “do no harm”? Could spirituality be the “saving grace” our world so urgently needs? This is a book rich in ideas and also stories. It includes an account of Stephanie Dowrick’s own spiritual evolution, and deeply moving stories from others.